If the franchise continues to feel a bit dull—heavy on the drama and light on the excitement, with pageantry long in the rear-view—there’s a respectable purity in the films’ political cynicism and populist fervor. 137 min. Lionsgate Films. Director: Francis Lawrence. Cast: Jennifer Lawrence, Josh Hutcherson, Julianne Moore, Liam Hemsworth, Philip Seymour Hoffman, Elizabeth Banks, Donald Sutherland, Jeffrey Wright, Jena Malone, Sam Claflin, Gwendolyn Christie, Natalie Dormer, Michelle Forbes. Quoth the Bard: “Quail, crush, conclude, and quell!” Welcome back to the space where, a year ago, referring to The Hunger Games: Mockingjay—Part 2, I wrote, “No doubt the gamesmanship will step up…after a long year’s wait.” That prediction has come to pass, marginally, as the $2 billion-dollar franchise adapted from Suzanne Collins’ YA novels comes in for a landing, but you also might just as well go back and read the review of Part 1, since it holds generally true of the somewhat more eventful Part 2. Director Francis Lawrence and his sturdy ensemble (minus Stanley Tucci) return for the final go-round, in which rebel teen idol Katniss “The Mockingjay” Everdeen (Jennifer “Remember, I won an Oscar” Lawrence) furiously resists the establishment (the Capitol) and its exploitative president, Coriolanus Snow (Donald Sutherland, whose meaningful gazes were never better). The main thrust of the plot finds Katniss driven to assassinate Snow, while delaying her romantic choice between brainwashing sufferer Peeta Mallark (Josh Hutcherson) and doggedly loyal commando Gale Hawthorne (Liam Hemsworth), whose moping indicates he feels he’s already lost. Indeed, moping is the mode of The Hunger Games: Mockingjay—Part 2, which seems determined to take all the fun out of the blockbuster movie (you thought Batman and James Bond were dour?). If the franchise continues to feel a bit dull—heavy on the drama and light on the excitement, with pageantry long in the rear-view—there’s a respectable purity in the films’ political cynicism and populist fervor. The most memorable action sequence finds crashing waves of oil (there’s a metaphor for this dying empire) threatening Katniss and company, a ragtag band of damaged minds and damaged souls that harbors little hope of prevailing but refuses to sit back and watch the world burn. In this familiar, if exaggerated, world of warcraft and economic injustice, the hero muses, “I guess there are no rules anymore about what a person can do to another person.” Again and again, this final chapter prods Katniss to tally the public and private costs of war, and to ask herself what she will and will not countenance to put an end to it all. Lawrence maintains a consistent production value, and it helps having great actors like Julianne Moore, Elizabeth Banks, Jeffrey Wright, and the late Philip Seymour Hoffman—in his final screen role—keep popping up. Still, for anyone not hanging breathlessly on Collins’ every word and plot turn (adapted by Peter Craig and Danny Strong), this protracted two-part adaptation remains problematically enervated, building to a twist even non-readers should see coming all the way up the Appian Way. The falling action makes like the ghosts of franchises past, (thanks)giving the fans something to squeal about and offer a last, wet-eyed three-finger salute. Lionsgate continues to stack the odds in fans' favor with their Blu-ray + DVD + Digital HD release of The Hunger Games: Mockingjay—Part 2. A/V specs are typically top-notch, although certain aspects of the image—along with the choice to pack over seven hours of video onto one BD disc—challenge fine resolution. It's tempting to speculate how much better the feature might look in the recently launched 4K Blu-ray format, but for a 1080p transfer, this one gets the job done fine. Daylight exteriors and close-ups naturally yield the most detail, but the frequently dark photography and the color-correction filtering put this digital-to-digital transfer on the soft and murky side when it comes to sharpness and especially shadow detail. Meanwhile, the aggressive Dolby Atmos sound mix is the star of this presentation, with soaring dynamic range down to the gut-rumbling LFE. The mix is precise and lively, with plenty of well-placed effects that go on the move in rear channels, contributing to an immersion alive with ambience. 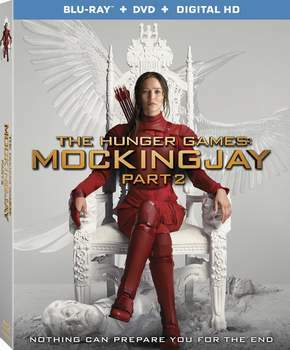 Bonus features prove extensive, beginning with an audio commentary with director Francis Lawrence and producer Nina Jacobson and the eight-part, nearly two-and-a-half-hour documentary "Pawns No More: The Making of The Hunger Games: Mockingjay Part 2" (2:21:45, HD). Comprised of eight featurettes breaking down the film's pre-production (adapted screenplay and designs), production (including special effects), the cast, and more, this is your first stop for insight into the film's making. "The Hunger Games: A Photographic Journey" (10:17, HD) introduces us to photographer Murray Close and takes us through his production stills. "Cinna's Sketchbook: Secrets of the Mockingjay Armor" (9:22, HD) delivers "what it says on the tin": a close look at the design and execution of a key costume. "Panem on Display: The Hunger Games: The Exhibition" (1:57, HD) is a teensy promo tease for the much-hyped touring exhibit of props and costumes from the series, along with interactive displays. One of the most interesting bonuses is "Jet to the Set" (41:58, HD), an episode of a TV series devoted to set visits and chats with actors. All site content © 2000-2019 Peter Canavese. Page generated at 04/24/2019 10:33:58AM.